We home school so we're not really "going" to school. However, that doesn't preclude us from being interested in seasonal titles and Candlewick Press always presents some curious picture books for particular occasions. I was asked if I'd like to review the additional titles and I (obviously) accepted. How Did That Get in My Lunchbox? : The Story of Food is listed as the American Farm Bureau's Book of the Year. 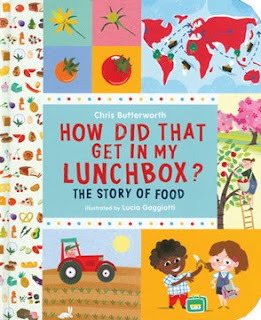 Geared toward kindergartners and the early grade levels, this book talks about where food comes from. (I bet you couldn't guess that all by your lonesome, could ya?) The book opens by explaining that although we tend to buy our food in stores, it doesn't grow there. In order to be able to eat a sandwich, a farmer had to plant wheat which then had to be harvested and sent to the flour mill. The flour had to be sent to a bakery to be made into loaves of bread. The cheese began as warm milk and ultimately is shaped into blocks which are sliced thin enough to go in the sandwich and so on and so forth. The text is simple and straightforward. The illustrations compliment the text very well giving the reader a greater understanding about how much work and effort is required to grow and produce the food that we eat. Nicely done! I very much like this title. Lastly, we took a look at Electrical Wizard: How Nikola Tesla Lit Up the World (release date: September 10th). Edison discovered how to use a direct current of electricity (DC) but a Serbian by the name of Nikola Tesla discovered how to use an alternative current (AC). People said that an alternating current could not be used safely and therefore ought not to be experimented with. Thomas Edison was one of Telsa's chief adversaries in exploring this alternate way of providing electricity but Tesla ignored the naysayers and ultimately prevailed. He was the one who discovered how to harness the energy of Niagra Falls, providing power to the city of New York City! I had never heard of Tesla before but this picture book has most definitely piqued my interest in the man. Definitely be on the look-out for this title! Many thanks to Candlewick Press for sending copies of the above titles for the purpose of facilitating my review and sharing my my honest thoughts and. I have received no additional compensation for this review.